Before I started this blog in early 2018, I knew NOTHING about blogging! I researched for weeks, trying to find out every detail of how to properly launch a blog. I kept a paper and notebook close at hand, writing down every piece of valuable information I found. I also wrote down any questions that I had, so I could find answers to prepare myself for each step of the process. I read dozens of articles called, “10 Steps To Successfully Launch A Blog”. But they were all the same – worthless lists of how to find your niche, choose a blog name, create a WordPress account, purchase hosting, and purchase an overly-priced blogging course. No added value and packed with affiliate links – just another way to earn some money from their readers. Although some of these facts are valuable to know, they are only surface-level blogging facts that will be useless after Day#1. 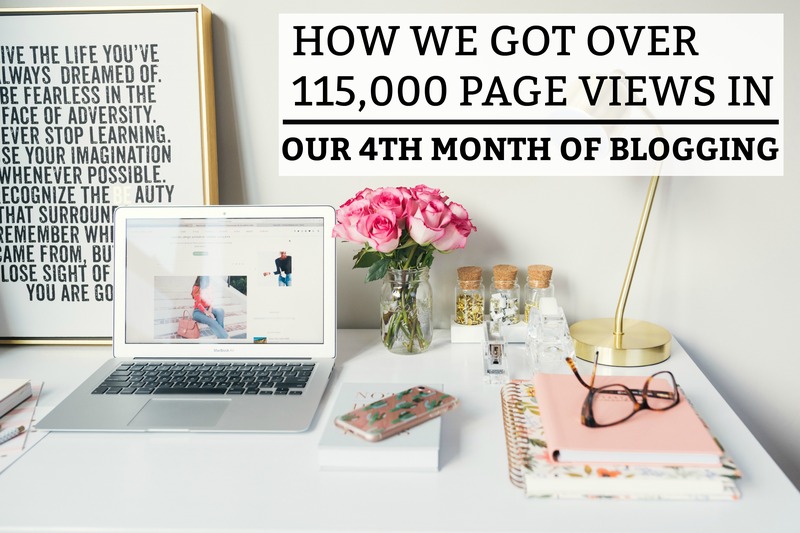 When I started the blog, my goal was to have at least 30,000 monthly page views in 6 months. I set very reasonable goals for the blog because I knew how disappointing it would be to never reach them. My reason for starting the blog was to replace my Corporate America income with my blogging income. Yes, I started the blog for money! Don’t believe the people out there who say not to start your blog for money! There is nothing like money to make you want to work harder. However, I wanted to earn the money fairly. If they clicked on one of my blog posts, I wanted to add some value to their life! No cheap, worthless posts! Below, I’ll give you some information that I wish I would have known back before I started. I had no idea this type of traffic was possible so quickly! Yes, it took a ton of work and dedication – but it was totally worth it! This was one of the most valuable things I did before launching the blog! Yes it was annoying and tiresome, but it helped us hit the ground running! I launched the blog with 35 published articles. 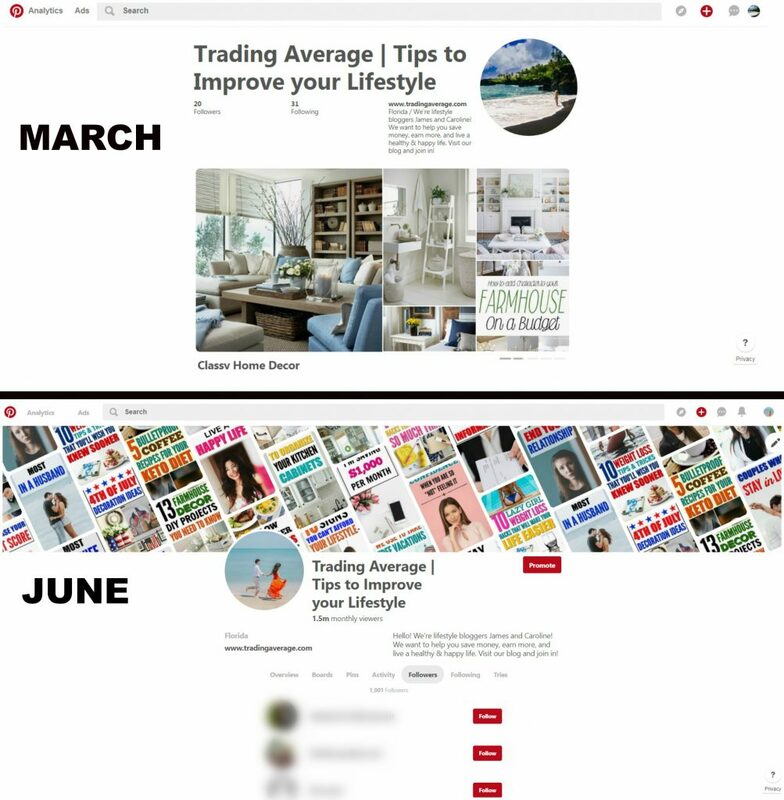 From Day #1, if anyone clicked on Trading Average, they would have assumed that it was a well-established blog. I also had 15 blog posts that were not yet published. It is always a good idea to have a few unpublished articles on hand, as an extra cushion of security in case you cannot create some content for a while. There are so many articles out there that will tell you that you can launch a blog with only 1 or 2 posts. That is true if you do not want to scale your blog quickly! Unless you plan on writing and publishing a lot of articles in the first month after launching, it is always best to already have a blog with an arsenal of previously published posts. One of the top goals of every blog is to try to keep their visitors on the website as long as possible. When you have a lot of articles already published, you can link these articles to each other – creating additional page views. In the end, launching the blog with 30-50 articles will show visitors that you are an established and therefore credible source of information. Although you may want to create unique content, you need to recognize that there are very few truly unique ideas left out there. Whatever you write, someone has probably already written something on the same topic. NO – this does not mean you should plagiarize other blogger’s content! However, if you see another blogger having great success with a certain topic, write an article on the same topic. Just try to make it better! I first heard about this concept from marketing guru, Neil Patel. He used the illustration that if you see a successful article called “15 Brilliant SEO Tips”, then you should write an article called “35 Brilliant SEO Tips”. Same topic – better information. This means that you have to work hard to drive traffic to your website. By far, Pinterest is the #1 page view generator for every blogger! Without Pinterest, my current blog success would have never happened. So far, my Pinterest success can be attributed to creating an attractive profile, creating Pinterest boards that were relevant to the topics that I wrote about, creating visually attractive pins, and joining quality group boards. …and I mean join a LOT of them! I spent days upon days joining Pinterest Group Boards because they are the main key to getting a lot of viewers. If you do not know what a Pinterest Group Board is, it is simply a board owned by someone who has to invite you to be able to contribute your pins to their board. If you get invited to join a group board, you gain access to all the people who follow that board! Meaning, if that board has 10,000 followers, your pins have the potential to be viewed by that many new people. See why group boards are so vital to your blog’s success!? You can always spot a group board because there will be a circle on the board with several account profile’s in it. When you click on the board, there should be some “Board Rules” listed under the name. They should let you know how to join the board: email them, message them on Pinterest, or fill out a form on their website. If there are no rules at the top of the page, you can simply message them on Pinterest or go to their website and contact them there. Compile a list of group boards that you would like to join. You can find these by looking at the Pinterest Accounts of people who are successful in your niche. You can also use PinGroupie.com and search for group boards centered around the topics you would like to write about. In the beginning, you should count on being invited to join 1 group board for every 10 you request to join. As time goes by and your Pinterest profile becomes more established, you should be added to more group boards more quickly. Now, as you join these group boards, you absolutely need to keep track of the boards you join! I created the form below, so that I could keep track of all the boards I joined and record when I was added, declined, or never responded to. I highly recommend you use a spreadsheet similar to this. 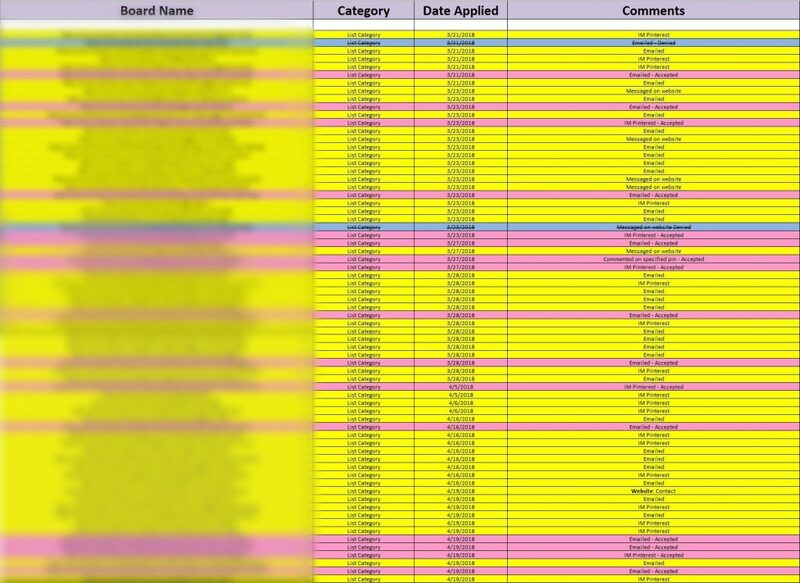 I applied to well over 100 group boards and it would have been very difficult to ever keep track of all of them! Requested Access = Yellow, Denied = Blue, Accepted = Pink. Knock your socks off color coding! List the board that you requested to join, the category in which it belongs, the date you applied, and any comments you may want to include. This way, you will know which boards to go back and re-request once you have more articles and your Pinterest account looks more established! PRO TIP: When requesting to join a group board, always introduce yourself in a polite and professional way! Let them know that you would love to join their group board, that you write content that applies to the group board theme, and that you will follow the rules and won’t spam. In addition, make your request clear and concise: clearly state the group board(s) you want to join and give them the link to your Pinterest Account and Website, so they can see that you are a legitimate blogger. If possible, ALWAYS use their name! If their Pinterest account doesn’t show it, click on their website and search for it. You should make it a priority to make the email as personal as possible! If you see something on their site that you enjoyed, let them know about it! In the blogging world, a personal connection is valuable! Your blog’s success is driven by this rule: 20% content & 80% marketing. In other words, you can write amazing content, but it will never be read unless you market it in a way that makes people want to click and read! We live in a visual world, where people typically read things if the titles are catchy and the pictures are visually pleasant. It took me a LOT of trial and error to find some pin styles that I loved creating! You probably won’t find the perfect style right away, but that is OK! The first few months of blogging is all about finding what works for you. In the end, your goal should be to find a pin style that represents your brand. This means that your pin designs shouldn’t be all over the place! They should be similar in design: font, colors, and size. This way, you are telling your reader that it is your pin instead of someone else’s. If Photoshop isn’t your thing, there are a lot of online programs to help you design your pins! I do 100% of my pin designs on PicMonkey. It is a free online picture editing site! However, I upgraded to the $5.99 USD/month or $71.88 annual fee because it has some premium features that I love to use. If you need to learn how to use it, you can find some in-depth tutorials on YouTube. Many other bloggers use Canva because they find it easier to create pins. Although I haven’t used this editing site very much, I have found that you don’t have to do as much hands-on editing with your images. I LOVE design and could spend hours creating pretty pins, so I prefer PicMonkey. Give both of these sites a try and find out which one you prefer! If you are not a photographer and need to find some free public domain photos to use on your website, here are a few of my favorites: StockSnap.io, Unsplash, Life of Pix, Pexels, picjumbo, tookapic, and picjumbo. For each of my articles, I always create 4-6 different pin versions. I choose a different image, title, and sometimes design for each of the pins. This tactic played a crucial role in helping me find the pin designs that worked for me and represented my brand the way I wanted it to. There have been many times that I have created a pin and thought, “This pin is never going to work! I shouldn’t even put it on Pinterest!” And then it goes viral – or at least mini-viral! When coming up with new content, always ask yourself, “Is there a need for this content? Is this going to add any value to the live’s of my readers?” Of course, you want to have a little piece of yourself in each blog post, but don’t make it all about yourself! Make it about your readers! Your readers are going to read your content only if it is going to peak their interest or solve a problem! Unless you have built a personal connection with your audience, like many well-known Instagram bloggers, your readers will not be interested in an in-depth account of your day. “Like, that is nice that you and your ex aren’t fighting anymore, but I really don’t care. It doesn’t apply to me!” That is exactly how your audience is going to think! Also, stay away form controversial topics! Unless that is your brand, you are going to alienate yourself from a lot of potential readers if you make your blog posts all about politics, social issues, and your world view. Of course you can add some of your viewpoints into your writing, but always remember that your blog is a business, not a opinion-filled hobby. Pro Tip: If you are going to write an article about something personal, like a family vacation, try to come up with a strategy to add some useful information that will help your readers accomplish something. The more followers your account gets, the less you will have to rely on other’s for your traffic – aka group boards. I know several successful bloggers who have over 100,000 Pinterest followers and they get the majority of their page views from their own audience reading and re-pinning their content. I officially launched my blog in March 2018 with about 3,000 pageviews that month. Now, 4 months later, I’m over 115,000 pageviews over the last month. Please understand that traffic will always fluctuate! Because of the nature of viral posts, my traffic is going to fluctuate up and down. However, little by little, I will consistently grow as I continue to create content that my readers enjoy! How have I been able to achieve this kind of growth? Use Google Analytics to see what your top performing posts are. When you see posts that are doing really well, I duplicate them in a different way. No, I don’t copy them and change the title – that is a major SEO no-no! I identify common themes in top performing posts and continue to write about them. Example: If you wrote an article called, “10 Simple Steps to Get out of Debt” and your audience loved it, you may want to consider writing more articles about getting out of debt! There are dozens of possible articles to write on any given topic. Every successful blogger talks about starting an email list. I agree with this, however, I have not yet actually started an email subscriber list. I hope to get one up very soon! When I first started the blog, my goal was to become successful without ever taking a course! I was positive that I could find all the information about blogging online – for FREE! For the most part, I was correct. My first few months of blogging, I spent countless hours researching topics regarding website frameworks, hosting, plug-ins, google analytics, coding, Pinterest strategies, affiliate marketing, and so much more. As I researched, it dawned on me just how little I knew about the blogging world! At times, I became very overwhelmed with the overload of information. However, I was too focused to give up. From the very beginning, I researched blogging courses that were worth investing in. But they were all very overpriced! I found a few courses that EVERYONE seemed to advertise, however, I was majorly turned off at the ridiculously high price! I have been able to find several low-cost e-books and mini-courses that have given me new insight into blogging. However, most of the information I learned could have been found elsewhere – for free. Do your research and look around before purchasing a course. There are thousands of courses out there that range in price, depending on how well-known the blogger/creator is. My only advice is to buy from someone you trust and who has genuine, proven blogging success! 10.) Don’t You Dare Doubt Yourself! Stop right there! You don’t need to fill your mind with that type of negativity! At one point, every successful blogger was exactly where you are – at the beginning of their journey! But they didn’t give up! They continued to invest in themselves – perhaps through some online courses, books, or classes. If you have a dream to create a blog and replace your income, don’t let self-doubt stop you! I still have a long road ahead of me – because I am still growing my blog! However, I always remind myself that I don’t have to know everything right now. As new issues and opportunities present themselves, I do more research and invest in educating myself on them. If you haven’t yet started your blog, TAKE ACTION! A few months from now, you will have wished you had started now! Hard work is the only thing that will bring success. A blog is not a get-rich-quick scheme, but it can be a way for you to bring in some extra income or allow you to work from home! I have read several surveys that found that only 9% of bloggers make over $1,000 per month. And only 4% make over $10,000 per month. I am currently part of that 9% and aiming to become part of that 4%! If you remain dedicated and focused, you could make your way into those statistics. If you have any questions about this article, just let us know in the comment section below! This is all excellent information! I do all the same things you do…except I didn’t start with that many posts! I really wish I had, because I found in practice once you start trying to pin and loop pins on Pinterest, 15 posts isn’t really enough…especially if you have a lot of niches (you do and so do I). Thanks Marissa! I completely agree! Although having a “lifestyle blog” does allow you to have a lot of niches, it does present the challenge to make sure you have an adequate amount of content on one particular topic. Congratulations on your success! Your tips are spot on! When I started my blog I did not have one single post ready. It was stressful trying to come up with content and grow my blog with two little ones at home. Starting with 50 posts is a great idea! Thanks for the Pinterest tips! Great info!! Great tips! I am struggling to grow my following and I think I know why now. Thanks! I need to get to work creating more posts!! ? have you done an update since writing this? Curious to see how you’re doing now. I also follow me. Neil, he is a great marketer and been around forever it seems. Best wishes ? Hello Jennifer! Sorry for the late response. Great! I’m glad you found some value here. Currently, I have more than tripled my following and page views. The steps I have laid out in this article have definitely payed off. I hope you are able to build your blog! Take Care – Caroline.